760 pages | 550 B/W Illus. As rapid technological developments occur in electronics, photonics, mechanics, chemistry, and biology, the demand for portable, lightweight integrated microsystems is relentless. These devices are getting exponentially smaller, increasingly used in everything from video games, hearing aids, and pacemakers to more intricate biomedical engineering and military applications. Edited by Kris Iniewski, a revolutionary in the field of advanced semiconductor materials, Integrated Microsystems: Electronics, Photonics, and Biotechnology focuses on techniques for optimized design and fabrication of these intelligent miniaturized devices and systems. Composed of contributions from experts in academia and industry around the world, this reference covers processes compatible with CMOS integrated circuits, which combine computation, communications, sensing, and actuation capabilities. 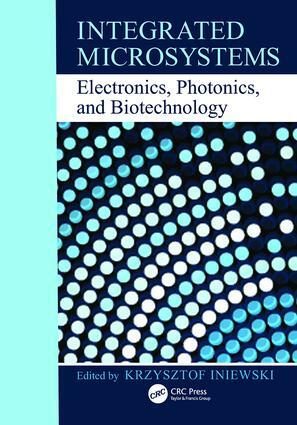 Light on math and physics, with a greater emphasis on microsystem design and configuration and electrical engineering, this book is organized in three sections—Microelectronics and Biosystems, Photonics and Imaging, and Biotechnology and MEMs. It addresses key topics, including physical and chemical sensing, imaging, smart actuation, and data fusion and management. Using tables, figures, and equations to help illustrate concepts, contributors examine and explain the potential of emerging applications for areas including biology, nanotechnology, micro-electromechanical systems (MEMS), microfluidics, and photonics. Krzysztof (Kris) Iniewski is managing R&D chip development activities at Redlen Technologies LLC., a start-up company in British Columbia. His research interests are in VLSI circuits for medical and security applications. From 2004 to 2006 he was an Associate Professor at the Electrical Engineering and Computer Engineering Department of University of Albelia where he conducted research on low power wireless circuits and systems. During his tenure in Edmonton he put together a book for CRC Press "Wireless Technologies: Circuits, Systems and Devices".